Chicken Tenders are delicious strips of white meat from either side of the breast bone. They cook quickly and easily, and are a low-fat source of protein. 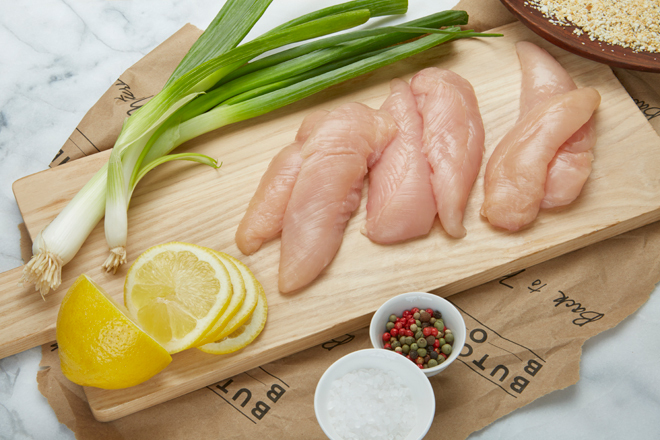 Ours come fully butchered and portioned, ready to be grilled, roasted, or breaded and fried as an appetizer. 2. Place Chicken Tenders at 45° angle across hottest part of grill grates, and grill both sides for 6 min per side, while rotating 90° every 3 min. Keep your meat moving to ensure that it cooks evenly. 3. Move chicken to cooler part of grill, and grill both sides for 5 min per side, while rotating 90° every 2 min. Remove from grill when meat thermometer inserted into thickest part reads 165°F. 2. Place Chicken Tenders on sheet pan. Roast in oven for 25 min, or until meat thermometer inserted into thickest part reads 165°F. Remove from oven. 1. Preheat large, heavy skillet (preferably stainless steel or seasoned cast-iron). 2. Add oil. Once oil is hot, sear Chicken Tenders for 8-10 min, while flipping every 1 min. Remove from skillet when meat thermometer inserted into thickest part reads 165°F.